Teaching your children how to look after their teeth is an investment in their future oral health. Teeth can start to decay from the moment they erupt; so proper care is essential right from the very first tooth. Teaching children great dental care is about forming strong habits, setting positive examples, and guiding children while they are young. Here are the steps you can take to help your child. All children are different but their first teeth will usually appear within 6 to 10 months and all 20 baby teeth should generally be present by the age of 3. Your toddler’s teeth need cleaning twice a day with a small, soft baby toothbrush, using toothpaste from 18 months onwards. Of course, you will be solely responsible for your little one’s dental habits at this time of life. Once your child reaches the age of two, they can generally start learning how to brush for themselves. 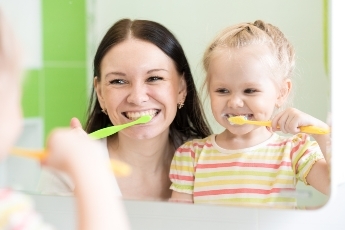 Let kids watch you brushing your teeth twice a day, then supervise their own brushing, making sure to cover the inside, outside and chewing surfaces of each tooth. You can make brushing fun by providing themed toothbrushes, turning brushing time into a game, or rewarding children with healthy snacks like cheeses. It’s recommended that your child’s first visit to the family dentist should happen within 6 months of their first tooth erupting. The dentist will check your child’s dental growth and development and make sure there are no problems. Before the visit, discuss what will happen with your child and explain why dental check-ups are important. Be positive about the dentist and resolve any of your own anxieties of you have some. Children are very intuitive and will often pick up on and reflect your attitudes. Try to lead by example when teaching your kids about oral health. Make them aware of when and why you brush, floss or use mouthwash. Teach children about why sugar is bad for their teeth and which foods should be avoided because of this. When snacking, focus on natural products that are good for teeth whilst being tasty and nutritious. Just like you, your kids should be visiting the dentist every six months for check-ups and professional cleaning. Some children can benefit from dental sealing, which is a thin coating to protect teeth from decay, so check with your Joondalup family dentist about this. Make sure you check your child’s tooth and jaw alignment as teeth grow. If any orthodontic work is needed, the earlier it can be planned, the more effective it will be. To book a child’s appointment with your local Joondalup dentist, call Anchorage Dental now on (08) 9407 7888 or contact us online for more information.